Is It Time to Replace Your Shoes? | Podiatry Associates, P.C. Is It Time to Replace Your Shoes? Do you cringe in pain every time you take a step in your high heels? Are your favorite running shoes looking closer and closer to retirement with each new trail you hit? It may be time to replace your favorite pair of shoes—but how do you know for sure? 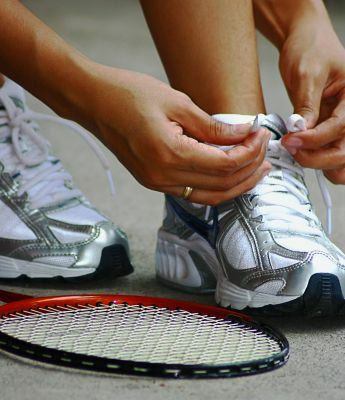 You may have heard that you need to replace your running shoes every six months. However, there are a number of factors to take into consideration to determine when is the right time to replace your shoes. How much do you weigh? Someone who weighs 120 pounds will exert less pressure on her feet and shoes than someone who weighs more. Your weight plays a role in how fast your shoes wear out and need to be replaced. How many miles have you tracked in your shoes? The six-month rule for runners is based on the assumption that you run approximately 300 to 500 miles in that six-month period. If you run less or more than that, you may need to replace your shoes at a different time interval. Where do you wear your shoes? Sprints across rocky terrain have a different impact on shoes than wearing high heels on a carpeted floor. Depending on the type of movement you do and the surface you walk on, you may impact how soon they need to be replaced. It can be difficult to know when you need to replace your shoes, but taking each of these factors into consideration can help. Look at your shoes and determine how supportive the inside and outside of the shoe is on your foot. If there is significant wear on the sole of your shoe, you may not be getting the support you need. If your shoes have caused harm to your feet, or if you frequently feel pain in your feet and ankles when you walk or run, you may need to consider looking at custom orthotics. For active people, custom orthotics can help you get the support you need. These custom casted inserts come in two styles. sports and dress. They come in two styles so that you do not have to worry about them showing in your heels, running shoes, or other favorite pair of shoes. If you know someone who frequently complains about their feet hurting, share this article with him or her on Facebook and tell your friend where to get relief when it’s time to replace their shoes. Contact Podiatry Associates at 303-805-5156 to schedule your appointment at our Castle Pines, Cherry Creek, or Parker locations today.